Ford has gone back to the drawing board to re-design the classic 1960s Cortina and make it fit for the 21st century as it today celebrates its 50th anniversary. Ford Europe’s chief designer Paul Wraith undertook the commission to mark five decades of the original Dagenham-built MKI Cortina, which was launched in 1962 to great acclaim. The commission came courtesy of motoring magazine Auto Express, which wanted to know how the car giant might transform the legendary family saloon car and re-invent it for today. The original Ford Cortina was launched 50 years ago today on September 21, 1962, costing from £573 for the standard 1200 saloon. Today a similar car range would cost from between £16,000 and £22,000. Auto Express Editor Steve Fowler said: ’Ford is celebrating 50 years of the Cortina and we’ve got them to design a Cortina for 2012 – meeting all today’s regulations, but with the size and style of the original. Ford designer Paul Wraith said: ‘The original car was accessible and agile. The body shape is really iconic and those ‘ban the bomb’ tail-lights are so recognisable. ‘But obviously we’ve got a host of global legal requirements we need to meet. The original Cortina design – with a jutting front bumper and sharp edges, would not pass today’s vitally important European crash tests to protect driver, occupants and even pedestrians, he says. Crumple zones would have to be designed in, the supporting pillars around the windscreen thickened and the windows made shallower to survive side impacts. The distinctive rear tail-lights are retained but given a sharper and more modern look. The two sharp ridges or ‘pontoons’ on the boot are retained in the 2012 version. But a wider rear windscreen is needed to ensure all-round visibility. And a lower, sleeker roofline is needed to fit with modern sporty taste. The boom in demand for diesel engines which are bigger and need more cooling, would require a bigger front opening. But Ford’s new frugal 1.0 litre three-cylinder EcoBoost petrol engine would be the perfect fit while satisfying today’s demand for fuel economy and performance, managing the sprint from rest to 62mph in about 10 seconds – compared with 20 seconds for the original - with a top speed of about 120mph. This is despite the extra demands of technology and safety pushing the weight of a new Cortina up by 50 per cent to 1.2 tonnes, compared to 0.8 tonnes for the original in the Sixties. That means more powerful brakes are needed and the chassis would have to be strengthened to cope. Air-conditioning, Bluetooth connectivity and DAB digital radio would be musts today. The original MK 1 Cortina with a 1.2 litre 4 cylinder petrol engine had a top speed of 76.5mph, took 20 seconds to get to 60mph from rest, and fuel economy of 30.2mpg. The souped-up Lotus Cortina had a top speed of 108mph and could sprint from rest to 60mph in 10.1 seconds and averaged 21.3mph. The 21st century Cortina with its frugal EcoBoost 1.0 litre 3-cylinder engine will sprint to 60 mph in 10 seconds with a top speed of 120mph and would average 56.5mpg. There were five generations of Cortina: the MK I (1962-66); MkII (66 to 70); Mk III (70 to 76), Mk IV (76 to 79) and Mk V (79 to 82). More than a million of the original Mk1 Cortina’s were built between 1962 and 1966 with total Cortina production topping nearly 4.3million by the time the Mk IV came to the end of the road in 1982. Celebrated in song, in poetry by Sir John Betjeman, in movies and on TV, some 3.15million Cortinas were built at Ford’s Dagenham plant in Essex, now given over to engine production. 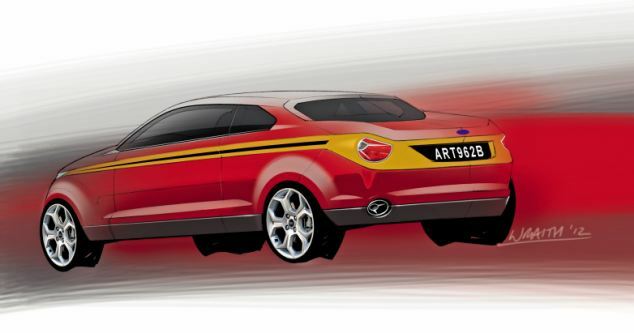 Will Ford put their designer Mr Wraith’s 2012 version into production and bring back the Cortina name? Lovely to think so – but don’t hold your breath. At first I was all like "yeah"
Then I saw it & I was all like "na"
The second drawing I don't mind, but they'll be raiding the parts bins for bits out of festiva's mondao's focus's & taurus's to make "something else"
Good lord, drawn by a 4 year old? No balance or proportion at all. f**k puke. Seriously what are the boss's of the design team doing? How could this POS be deemed good enough for the public to view? They seem to be getting desperate lately with radical moves to up publicity. The picture is nothing like the original. The last picture looks like a Mini Cooper S whacked out on LSD. please just use some left over European three door car tops and place on this body. If you want, I could draw pictures. Just send $66 so as to buy a cheap scanner off Ebay and will upload to you within 24 hours. Toyota has the right idea with the new 86, back to basic, 2door minimalist sports car, unfortunately still has most the fapper mod cons and looks like a space ship.... who wants "Telepathetic Stability Control & Traction control etc" in a frikkin sports car? what's wrong with these people? STOP TRYING TO MAKE CARS DRIVE THEMSELVES INTO PARKING SPOTS AND LET US GET ON WITH THE JOB! A sports car is a sports car, soccer mum bus -family car - fugal meister - gas guzzler, there used to be a difference. Design a car for one market, one size doesn't fit all. That's exactly what I am saying, yes. Ford has a FOCUS and some other crap Euro cars that actually happen to handle well, go and stop reasonably and have strength in the right places. Remember original Cortina was a good rally car? Not the Mark4 people mover, the one and twos of the racing world... Good little machines. 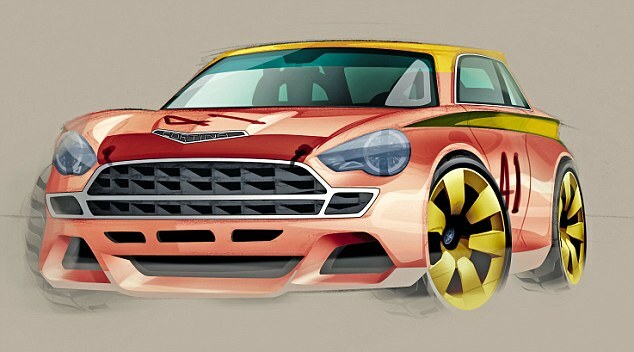 As someone who actually likes old English fords, I have to say that drawing is POO. It doesn't instantly say Cortina. Ford continually keep dropping the ball and producing poor quality UGLY cars. They need to sack the entire design team and stat fresh. Last edited by tickford_6 on Fri Sep 28, 2012 3:46 pm, edited 1 time in total. my missus just bought a new focus, last of the german made ones, they should just stick with someone elses engineering because their own is poo these days. Unfortunately though now all focus' are made in taiwan along side hiluxs and the like, and just about everything else.... only time will tell how that goes. Also the build quality difference between a fiesta, a focus and a falcon is just too far apart to be believable. Thanks global engineering, sticking it to australian made everything since it's inception.